Dad. I've got very, very, very bad news. Peter was killed tonight . . . With that middle-of-the-night phone call, life for the Mayer family plunged from best-ever year to months and years of dealing with the oppressive presence of Peter's unending absence. A letter from his father to the freshly deceased Peter, intended for the memorial service, became the first in a torrent of letters from his dad to Peter, though which his dad poured out agonized and angry grief. 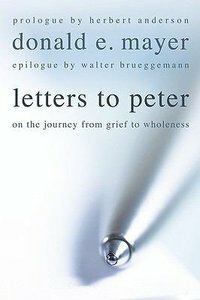 In the letters, Peter's dad laments the way events otherwise beautiful for Peter's wife, five-year-old daughter, and the rest of the family are relentlessly punctuated with the pain of the loss. Dammit, Peter, why didn't you . . .? Ultimately, slowly, the letters begin to reflect on the strange mystery of healing. How is it that in spite of the pain, in spite of the unending loss, comfort does come, opening the way once again for unbelievably deep joy? It was all so rich and beautiful that with a certain private touch, and exchange of glance, your mom and I signaled an agreement . . . slipped to our cave . . . with playful freedom and deep gratitude. So for Peter's dad, the confirmation of the odd observation from Jesus: How blessed are those who grieve! Herbert Anderson is currently Research Professor of Practical Theology at Pacific Lutheran Theological Seminary in Berkeley, California. He is the author or coauthor of over ninety articles and thirteen books, many of which are focused on integrating theology and family systems theory. Dr. Walter Brueggemann (Th.D., Union Theological Seminary, New York:; Ph.D., St. Louis University) is Professor Emeritus of Old Testament Theology and Interpretation at Columbia Theological Seminary, Decatur, GA .
His award-winning Theology of the Old Testament (Fortress Press, 1997) quickly became a foundational work in the field. The Association of Theological Booksellers presented Walter Brueggemann and Fortress Press with a Theologos Award for Best General Interest Book at a dinner in Brueggemann's honor, for the award-winning book, Deep Memory, Exuberant Hope: Contested Truth in a Post-Christian World. His recent publications include Mandate to Difference: An Invitation to the Contemporary Church, The Theology of the Book of Jeremiah, Like Fire in the Bones: Listening for the Prophetic Word in Jeremiah, and The Word That Redescribes the World: The Bible and Discipleship.